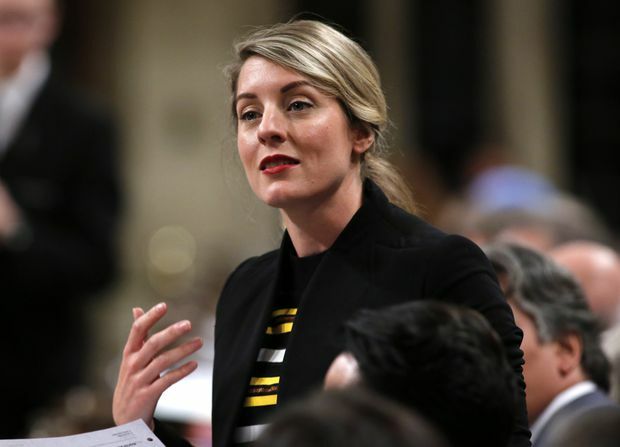 After a punishing false start and several months of throat-clearing on the issue, Heritage Minister Mélanie Joly confirmed this week that she will do nothing to limit the hegemony of Netflix and other foreign streaming services until after the next election. On Tuesday, the minister punted the issue, and others related to broadcasting and online services, to a non-governmental committee that has 18 months to mull it over. Federal Heritage Minister Mélanie Joly rises in the House of Commons during Question Period in Ottawa on Thursday, June 7, 2018. And yet, more than four years will have gone by before a bill to translate that uncomplicated resolve into action comes before Parliament. That’s assuming the Liberal government wins a second mandate. In much of Canada, the issue around Netflix and Cancon has to do with protecting creative industries. In Quebec, it’s seen as an urgent matter of cultural survival. For a francophone minister from Montreal, Ms. Joly has been staggeringly deaf to that concern. Last fall, she was pilloried in her home province for claiming she had cut a lovely deal with Netflix, without being able to point to any commitment that the service would run Quebec francophone productions. At a Senate session last week, she praised herself for joining government with a keen interest in digital commerce, at a time when “not many people were talking about [it].” And yet in terms of cultural sovereignty in the digital realm, she has been as ineffective as if she had taken her job knowing nothing. A scan of Netflix’s offerings in Canada makes for a damning account of the minister’s progress. In spite of her famous deal, there’s very little from Quebec. You can watch the popular 2006 comedy Bon Cop, Bad Cop, but not the 2017 sequel, nor Les Affamés, the smart and well-received zombie film that won awards for best picture and direction at last week’s Gala Québec Cinéma. Good luck finding any kids’ shows to reassure francophones who fear that their experience of growing up with Quebec children’s programming won’t be repeated by their kids. In other respects, Netflix in Canada has a lot to offer French speakers. You can opt for French audio or subtitles for a wide array of programs, from Jessica Jones and 13 Reasons Why to Clifford the Big Red Dog and Barbie: Life in the Dreamhouse. Those are all American productions, translated for Netflix’s affiliate in France. German, Italian and Spanish versions are also readily available. That’s how commercial cultural hegemony works: You translate your stuff into the languages of your colonial territories. Netflix in Canada has at least two original productions from France coming this month, including La Forêt, a crime series produced in co-operation with the online betting platform Winamax, for which you can place “a live bet on the murderer’s identity.” Netflix has also just licensed two seasons of the Quebec crime series Le clan, offered in the original Quebecois French with optional English surtitles. Oddly enough, the deal for Le clan was done with Radio-Canada Distribution. This is an offshoot of the same public broadcaster that is competing against Netflix with ICI Tou.tv Extra, a subscription service that’s entirely francophone and mainly Canadian. Presumably the distribution arm has to look out for the client’s best interests, which in this case seems to have favoured a Netfilx deal. Could that be the way of the future? Netflix also offers French versions of English-Canadian programs such as Kim’s Convenience, Alias Grace and Anne, the Green Gables reboot. None of that carries much weight among those who care about preserving a digital space for Quebec stories and Quebec talent. Meanwhile, the Heritage Minister can congratulate herself on finding a way to neutralize a sensitive file for another 18 months, with no obligation to pay any heed to whatever conclusions her panel reaches. Perhaps when the time finally comes to write legislation, her job will be held by someone with the will to get something done. As Ottawa challenges online media giants, what power can Canadian cultural industries still wield in 2018?